This post may contain affiliate links for your shopping convenience. View our full disclosure policy HERE. 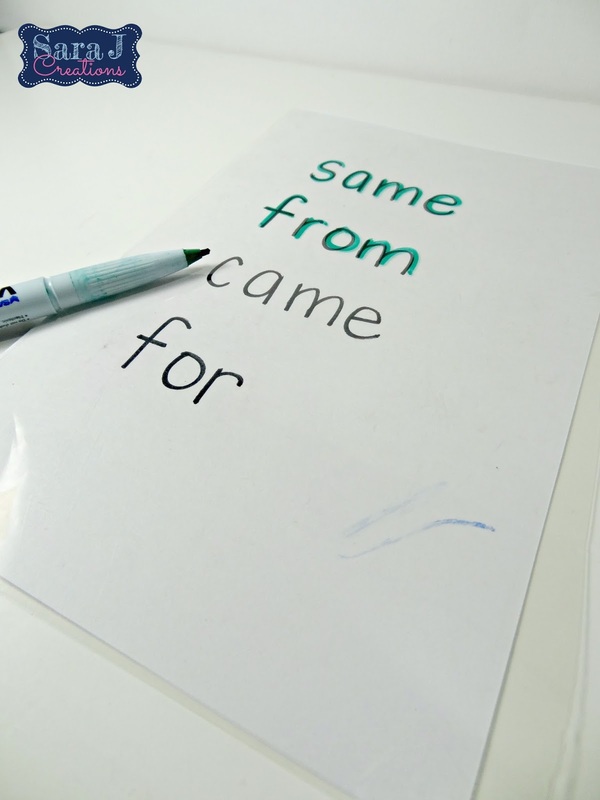 Practicing sight words is vital for young learners to improve both their reading and writing skills. 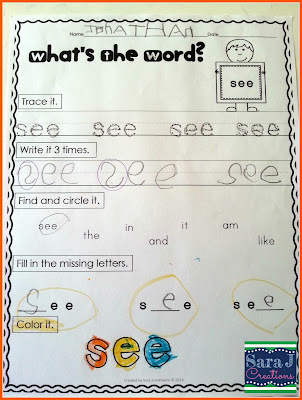 Sight words are tricky because they do not always follow spelling patterns and can't always be easily decoded, yet they make up so much of the text we see in print. Often times students need to just memorize these words and know them "by sight" to make it easier to recognize them in text. Memorizing is never fun but there are lots of ways to make practicing sight words more hands on. In my classroom, I loved using different ways for students to manipulate and create these words. 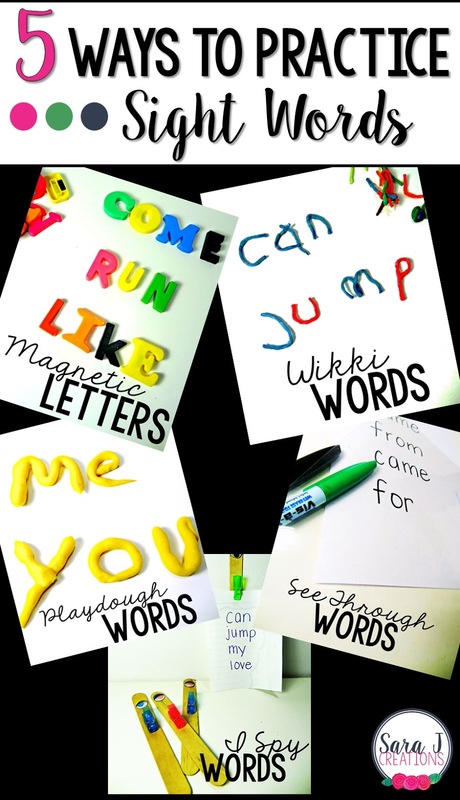 Here are 5 simple ways that you can have your students practice sight words. 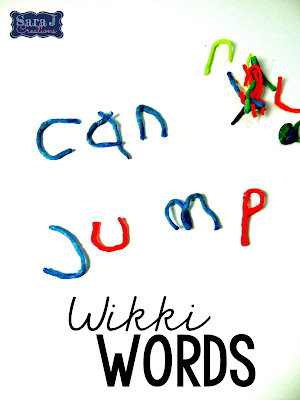 Wikki stix are yarn dipped in wax that create a flexible building material similar to a pipe cleaner. They can be bent into different shapes. I would have my students bend them into letters and spell each sight word that we were working on for the week. TEACHER TIP: Cut the wikki stix down to smaller pieces so a package can go further. I put them into sandwich bags with 10 tiny stix which was enough for them to make a word or two and then start again. The version that I linked to above already come in small packs - cut them in half and you are good to go. 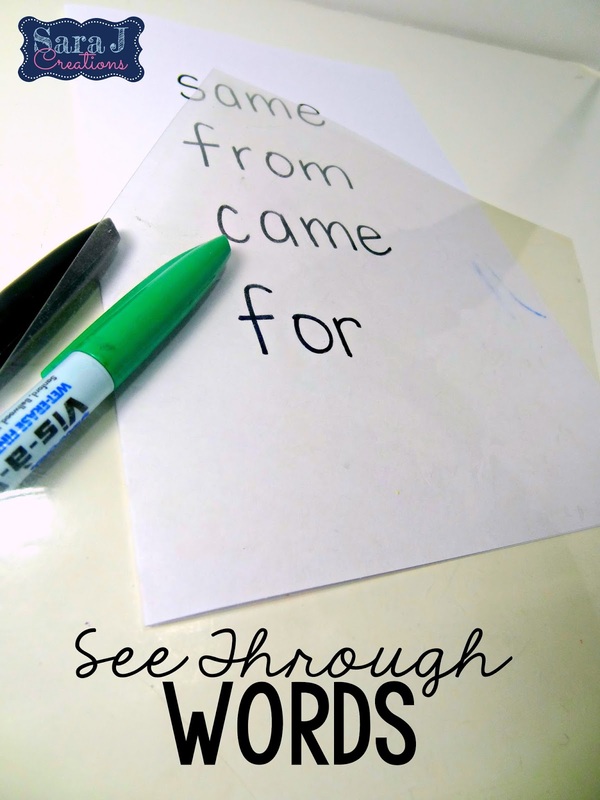 I Spy words are a way to get students up and moving around the room and "reading the room" to find the sight words they are working on. We made I Spy sticks by hot gluing googly eyes and plastic clothespins to a popsicle stick (the thicker tongue depressor kind). 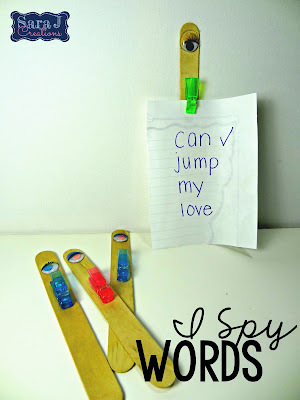 My students would write their words on a piece of paper, clip it to their stick and search the room for their words. When they find the word, they check it off. TEACHER TIP: Cut up scrap paper into 1/4s for students to use. No need to waste new clean paper! Magnetic letters are a great way to make words. 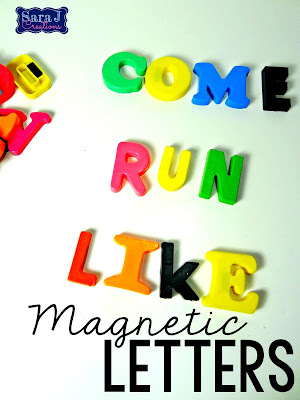 Sometimes my students would build the words on the floor, sometimes on the side of a filing cabinet, sometimes on the board, sometimes on cookie sheets. It doesn't matter as long as they are building words! 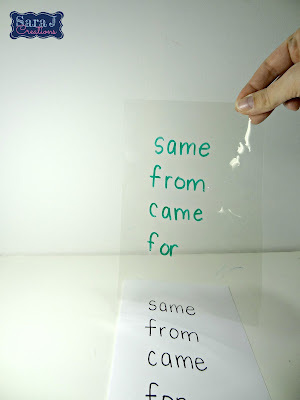 TEACHER TIP: Put one of each letter (and a few extra vowels) into sandwich bags so students can grab a set and go. I used a combination of sets (mostly from the dollar store) which left me different fonts and both upper and lower case letters. 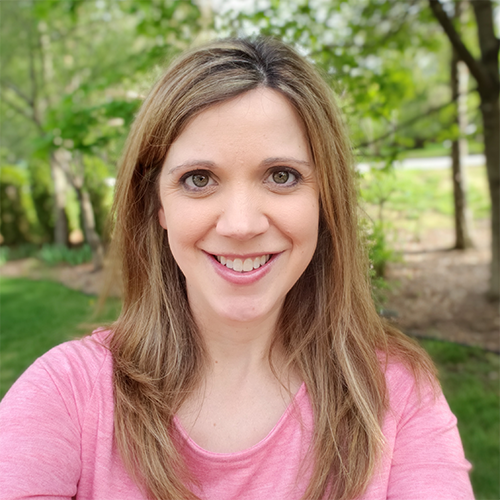 As a second grade teacher this didn't bother me much, but if you teach in a younger grade, you might want to stick with all upper or all lowercase letters. Do you remember overhead projectors? We still had them in my building when I taught but they were being phased out. But we were left with a lot of the film sheets that you used on them. We cut the sheets in half and used them for see through words. 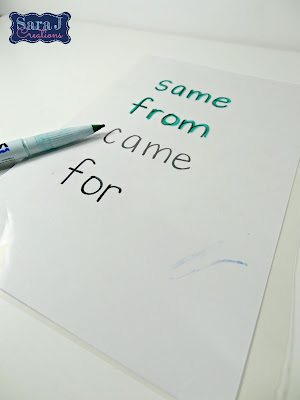 Students would use a piece of paper and write their words. 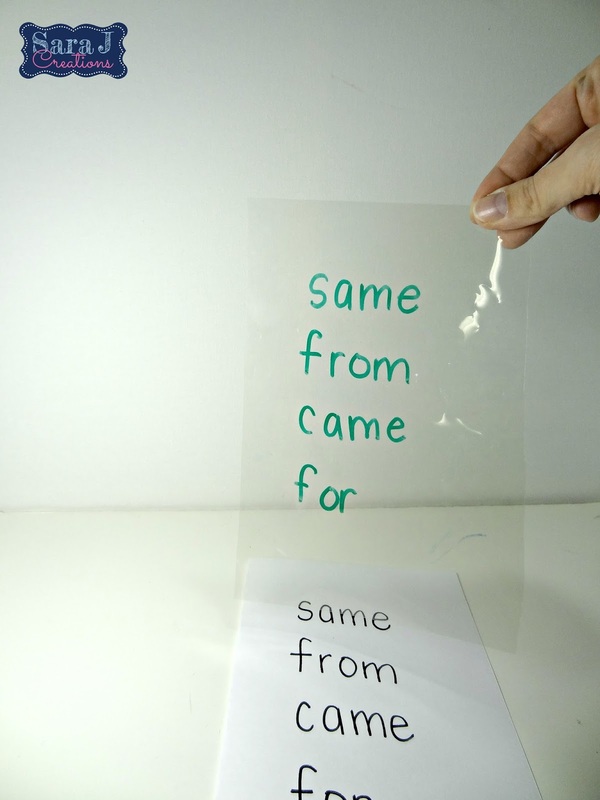 Then they would set a piece of transparency over the top and with a Vis a Vis marker, trace over their words. Then they would lift the sheet and read the words. TEACHER TIP: To make clean up a snap, we cut up baby wipes into quarters and put them in a bag next to the supplies. When they were done, students would wipe off their transparency sheet, wave it in the air to dry and it was ready for next time. This was much less of a mess than letting them wash them at the sink. If you can't get your hands on transparency sheets, you could use lamination or page protectors in the same way. 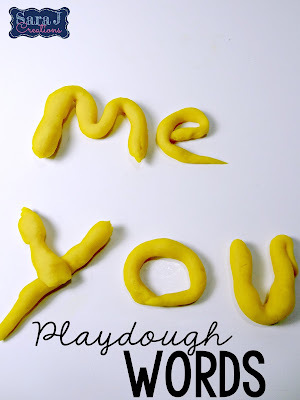 Playdough is another fun and easy way to practice sight words and a great way to build up the muscles in little hands. Simply roll out the dough and spell each word. TEACHER TIP: Have a parent make some homemade dough and divide it into small bags. Also, we found the mini Play-Doh brand containers were the perfect size for them to make one word and then start again. Then when it got dried out and needed to be tossed, you weren't wasting a huge container of dough. Sometimes after all the fun tactile practice, students just need to practice writing and identifying those words even more. I have a little freebie for you that includes the following What's the Word? format for the words and, big, do, that, went. Click HERE to download your copies now! 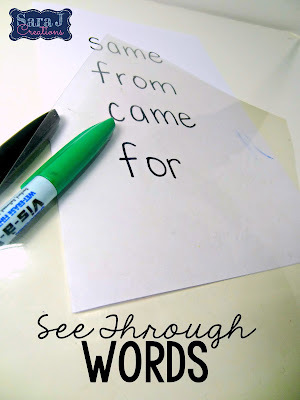 Need More Sight Word Fun?